and asked me if I could make something sweet for them. 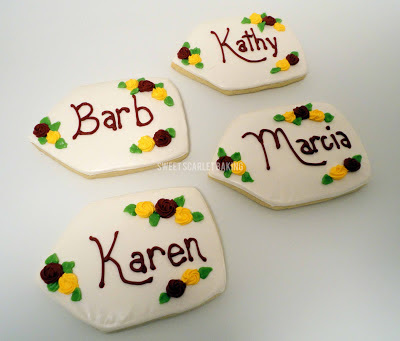 I thought it would be fun to use decorated sugar cookies as place cards on the table. 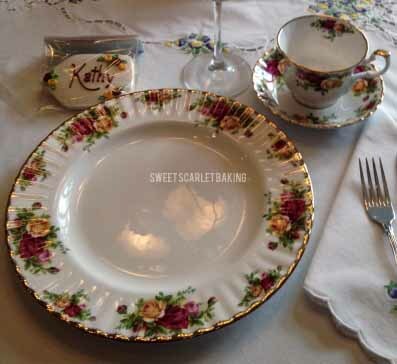 My mom collects china like I collect shoes, so I knew she was going to make it fancy. She was planning to use this classic china, Old Country Roses from Royal Albert. So, I added some burgundy and yellow roses to the cookies to match her place settings. These swirl roses were simple to make. I followed this tutorial from Sweet Sugar Belle. With the party favor topper folded over to create a "tent,"
the place card decorated sugar cookies stand up nicely on their own.